The Festival Pageant is a dramatic representation of how the church incorporated ancient beliefs into Christian ideology. 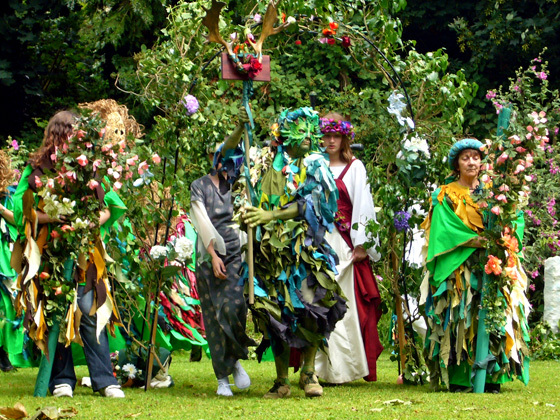 The story of how The Green Man ultimately meets The Prior has always been at the core of the annual Pilton Festival. The Green Man is an ancient Pagan symbol of nature and fertility frequently depicted in carvings in old churches as a face sprouting foliage. A splendid green man carving can be seen on the screen between the Chancel and the Raleigh Chapel in the ancient Parish Church of St Mary the Virgin in Pilton. The Prior of the Benedictine Priory of Pilton lived at The Bull House below the Church until the Reformation. 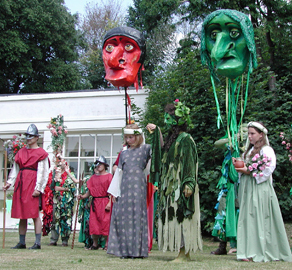 The Ritual enacted at the Pilton Festival is believed to represent the initial antagonism of the two characters, Prior and Green Man, represented by the red and green masks (left), and the subsequent inclusion of the pagan figure within the Church. Under the direction of Hamish Patrick, it takes place every Green Man Festival Day on the lawn in front of Pilton House at 12 noon and then again at 3pm. There is always a need for more volunteers to take part in the Pageant so contact a member of the Festival Committee or email us through this website - click on the link below - if you are interested. There are no words to learn as there are no speaking parts; it is all mimed.